Did you know that having a good credit report and credit score can help you become rich and wealthy? Yep, your credit can help you build wealth, save money, and increase your net worth significantly. A good credit score can save you hundreds of thousands of dollars over your life-time in interest charges! Why you ask? Well, it’s simple. By having good credit, lenders want to lend you money because your good credit scores tell creditors that you’re a good borrower who always pays back their debts. Since you have a good credit history, lenders take on less risk by lending money to you. When you have a positive history of credit, lenders will be much more willing to offer you lower interest rates on loans, which of course saves you money. There’s never any time like the present, and now is the best time to start building your credit and improving your credit score and credit report, even if you currently don’t need to borrow any money. It really surprises me how many people don’t care about their credit or avoid monitoring and tracking their credit reports and credit score. They think just because they don’t need to borrow money today that they won’t need to borrow money in the future. But, what they neglect to consider is that life happens and somewhere down the road, whether it’s four or five years from now, you’ll probably need to start thinking about buying a home or maybe plan for a wedding. Maybe you’ll want to buy a new car or boat. Maybe you’ll want to take a dream vacation or travel the world, who knows. What if you had an unexpected new born child? Do you know the costs associated with having a new baby? It’s ridiculous! A friend of mine at work just had a new born child and between the hospital bills, buying a crib and other supplies, the new love of his life has already costed him almost $15,000 in just a few short months and that’s just the beginning. Track and Monitor Your Net Worth and Manage All of Your Financial Accounts for FREE with Personal Capital! Basically, what I’m saying is you never know when you’ll need a loan or want to borrow money. All of our wants, needs, and desires can change in a split second. Or, life can throw a curve ball at us for better or worse which might require us to borrow money. So by taking small steps to build upon and improve your credit score and credit report today, you’re setting yourself up better financially which can save you hundreds of thousands of dollars in the future! Many of the people reading this are probably saying, “yeah, whatever…” about what I just said above. Although, one big difference between rich folks and regular people is that financially rich people plan ahead, before they ever need to plan. You can check your credit report and credit score for FREE anytime on Credit Sesame’s secure website. If you’re like most people, you probably don’t believe that the interest rate you pay on a loan or other debt makes that big of a difference. But, believe me when I tell you it makes a huge difference! Want proof, check out the infographic I created below. Let’s assume you purchased your first home and took out a 30-year mortgage loan, borrowing $200,000. By looking at the infographic below, you can get an idea of what you would pay based on what your credit score is. The numbers and amounts in the image and infographic above are figures I borrowed from a scenario I found while reading the book I Will Teach You To Be Rich by Ramit Sethi. It’s an outstanding read, and if you haven’t yet read the book, I encourage you to do so. 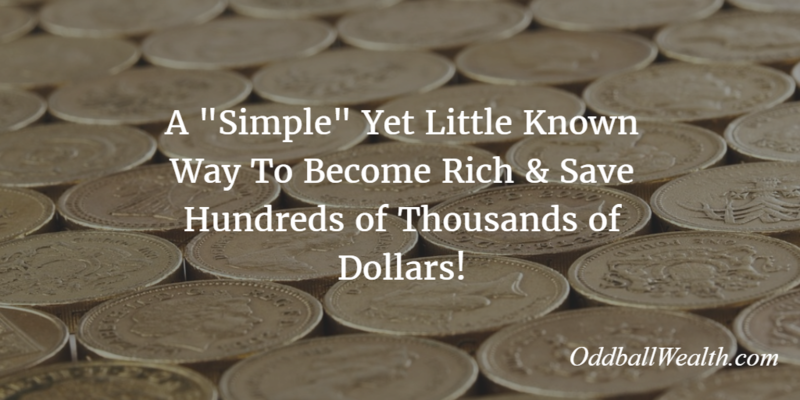 The book goes into great detail on how to improve your finances, build wealth, and become rich. By looking at the numbers above, it’s clear that the higher your credit score is, the more money you save. Over the lifetime of the loan you can save hundreds of thousands of dollars based on your credit score alone. People love to save money! Some people will spend hours every week just cutting out coupons to save a buck. Other people, like my sister and future brother-in-law for example, have a large garden. Which cuts down on their grocery bill and allows them to save money and eat fresh vegetables. For myself personally, I’m a huge coffee drinker. So to save money I brew all my coffee at home. To save even more money I find deals and purchase my coffee grounds on Amazon. I’m sure you understand what I’m saying. It’s great to save money and be frugal, but don’t neglect the big picture! It can be fun and mentally stimulating to focus on the little things which can save a dollar here and there. But, we also need to focus our time and energy on the big ticket items that save a lot of money which are huge money savers. Most of the time the things that save us the most money (like hundreds of thousands of dollars) are things that the majority of us are unaware of, like improving your credit. So, leave a comment below as to how your credit score has helped you get a loan or financing? And, how much money you saved by securing a low-interest loan or mortgage based on your FICO score? Great post! Until I took an interest in finance I actually had no idea your credit rating affected the interest rate on what you borrowed. I spent about 18 months building up my score and now can pretty much pick from the best rates around. I know it’s crazy to think about the amount of interest some people end up paying over the life of their loans. Also, great job on building your credit back up! This is genius. Thanks for sharing your insights to us.